Editor's note: A worship service in honor of Joe Snell was held October 25, featuring the SPU Gospel Choir and Ensemble, and special guests DaNell Daymon & Royalty. An offering was taken for the new Joe K. Snell Minority Student Scholarship Endowment. Joseph Kevin Snell, formerly the assistant director of student programs and director of intercultural affairs at Seattle Pacific University, died unexpectedly August 5, 2009. He was 46 years old. One of four children, Snell was raised in Texas, eventually attending Lamar University in Beaumont, Texas. He then received a master’s degree in management from Regis University in Virginia. In 2001, Snell joined the staff of Seattle Pacific University. He quickly became instrumental in helping the University expand its then-new diversity initiative. During his time at SPU, he helped students form the ASSP President’s Action Committee; the Mosaic cadre for students exploring the topic of reconciliation; Night of Beats; and the student club Salsa. He also guided students in their efforts to bring the National Christian Multicultural Student Leaders Conference (NCMSLC) to the SPU campus in 2004. 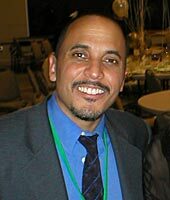 In 2007, Snell left SPU and became the director for Multiethnic Programs at Azusa Pacific University in Los Angeles, California. Predeceased by both his parents, he is survived by two brothers, a sister, and many other family members. Response invited colleagues and friends to share their remembrances of Joe Snell here. If you have a remembrance of Joe Snell, too, tell us, and see it posted below. Posted June 28, 2016, at 7:02 a.m. I will always remember Joe as one of two people who were instrumental in our College and Career class revival that occurred in the late 1980's and early 1990's. Joe's love for Jesus was contagious. Absolutely no question our pal is with Jesus now. We use to call him Joby-Whan-Knobe in our circles in Beaumont, Texas. Joe and and a few of us bachelors at the time founded the Yabba-dabba-do club, where we would pray in tongues and then go out and witness to the lost folks. Got to share a lot of great times with this man. Thank God for the blood of Jesus which washes away all our sin and in do time we'll get to see Joe again. Been 7 years nearly and to Joe it probably feels like 7 min. Posted November 1, 2009, at 6:35 p.m. I was privileged to spend about 2 years in a mentoring relationship with Joe. The thing I can say about Joe with absolute conviction is that he passionately believed in racial reconciliation among all men, and especially within the Body of Christ. Although that was not the subject of my work with him, we spent hours talking about the subtle racial distinctions that operated within the subconscious of the Church. And, although that was not the subject of my work with him, he challenged me to look within my own self and see the below-the-surface racial biases that I held without awareness. I am a better man for my time with him. Joe was a deep thinker, earnest, insightful...and dang funny. When it was his turn to speak at our little men's group, he surprised the heck out of me! Here was this serious, quirky, sometimes tormented brother acting like a veritable comedian, and cracking us all up--I realized there was another whole dimension to Joe that I had not glimpsed. I lost touch with Joe after he moved to California. News of his death shocks me and saddens me, but like others have mentioned below, he is now whole and at peace, united with his Lord and reunited with his beloved mama and others. I look forward to catching up with him again someday. Posted September 17, 2009, at 10:32 p.m.
For seven unforgettable years, Joe played many roles in my life. When I moved to Seattle to attend college, Joe was my mentor. He played the role of a pastor and provided me with pastoral care. When my father neglected and did not love me, Joe provided me with fatherly love and nurturing, and when my heart was broken he was my shoulder to cry on. When I graduated from Seattle Pacific University, I can remember Joe, standing in the pouring rain, drowning in his regalia, with his thumps held high, he shouted, "Marcus, we did it!" I recall Joe giving me the biggest high five and biggest hug as his arms wrapped around me as the rain continue to poor. Afterwards, my family, my friends and Joe, returned to the house for a time of celebrating and sharing. As Joe was meeting and greeting my family at the party, I remember thinking how much of an imprint Joe left, which shaped the young man I have become. Joe met me when I was hopeless, fatherless and broken. Joe was a man full of hope and believed that reconciliation was for everyon: churches, schools, companies, families, male & female and all ethnicities. He taught me to find what I was passionate about and pursue my dream. Joe was a smart, intelligent, funny, heartwarming, nerdy, guy. I miss him. Joe had the ability to make you laugh so hard that tears would flow. Because of his passion for the lives of others, Joe encouraged me to continue my education. He taught me that ministry is a profession and a calling and one most be fully equipped to handle it. For that very reason, I applied and was accepted into seminary at Azusa Pacific. When Joe encouraged me to go to graduate school, he had no clue that I had chosen to spend the next three years with him again. When I surprised him in California, and informed him that we would be together for three more years, Joe had to sit down and do the math. He had to add the five years in Seattle plus three more years at APU, that equaled early retirement for Joe. So Joe did what he had been doing the last five years we spent together in Seattle, he took me to lunch. If there was one thing Joe and I did well, it was eat a bucket of fried chicken. For Joe, fried chicken was not the same without his red rooster hot sauce. For the last two years, Joe did what he did best, he mentored me, he loved me and he spent countless hours listening to me. Joe and I never knew how to have short conversations. But that's why he was Joe. A few weeks before Joe passed, we spent three hours talking in his office. Afterwards, he gave me a couple of things to do that would help me. He passed away before I could tell him that I had did exactly what he told me -- for once! The most important noteworthy attribute of Joe was that he was authentic. Like the rest of us, he had struggles, issues and much heartache. The pain of losing his mother was difficult both before and after her passing. Joe would find comfort in knowing mama's resting in the arms of the almighty. He would sit in his office and regardless of what he was doing; he always had gospel music playing on his computer. Joe loved Jesus and he knew God would supply all his needs. Shortly before Joe's death he was with Amber Brown and Denise Gleason on his way to lunch. In a bittersweet way, how awesome is it to receive an invitation to dine with the Master and sit at His table. How awesome is it to feast on His everlasting peace, and to drink of the cup of the living water that will never run dry. Paul said to be absent from the body is to be present with the Lord. In a twinkling of an eye, Joe saw Jesus. He is not struggling anymore. He has no pain and no heartache. Now his soul rest in the arms of the almighty and he is hurting no longer. For many will come in his likeness, they may tell jokes like him, they may talk like him, and they may even be able to imitate him to the very essence, but there will always be only one Joseph Kevin Snell. I love you, Joe! Posted September 11, 2009, at 8:31 a.m. I was blessed to share some quality time with Joe Snell at a few NCMSLC conferences and am grateful that our Lord allowed us to do so. He had such a wonderful spirit and it was like a ray of sun light. Thank you for extending this opportunity for us to share and grieve with you and your institution. Just remember, he is not gone, Joe lives within us all. Many blessings to you and SPU during this difficult time. Posted September 11, 2009, at 8:24 a.m.
“His master replied, ‘Well done, good and faithful servant! You have been faithful with a few things; I will put you in charge of many things. Come and share your master’s happiness!’"
On Wednesday, 5 August 2009, Joseph Kevin Snell, passed away of an apparent heart attack. Joseph was affectionately known to many as Joe, however, to close family he was simply, Joby. Joe chose to pursue his undergraduate degree at Lamar University in Beaumont, Texas. His master's degree in Management was earned at Regis University in Virginia. Most recently, Joe served as the director of Multi-Ethnic Programs at Azusa Pacific University in Los Angeles, California. Prior to his appointment at APU, he successfully served in a similar position with Seattle Pacific University in Washington. Also, he and his student leaders were regular attendees of the National Christian Multicultural Student Leaders Conference. In fact, Joe secured NCMSLC for SPU in 2004, and served as the host site director for the conference. Through his diligence, commitment, guidance, collegiality, attention to detail and warm spirit, he and his SPU colleagues and students produced a highly successful conference. Many were touched by Joe’s genuine compassion and benefitted from his sincere selfless leadership. His warm smile and inspirational supportive footprint will forever be with us. Our hearts, thoughts and prayers are with his family, students, colleagues and friends. Posted September 7, 2009, at 10:35 p.m.
As Tali wrote in his sermon for Joe, there are many of us who experienced countless "Joe moments" at SPU that helped us through times when we were hard-pressed and perplexed. I distinctly remember a day when I was feeling completely disillusioned after a group discussion and I rushed into Joe's office, holding back tears and gushing with questions. Joe gently validated me and gave me resources that helped me to understand the group dynamics that I was encountering. Then, and many times since then, he encouraged me to patiently and persistently seek God's kingdom in all of its rich diversity. And, he found a way to make me laugh--let's be honest--when Joe laughs, you can't help but laugh along with him.